Reverso Un clon trooper corriendo hacia la batalla con su rifle de confianza. Un clon trooper corriendo hacia la batalla con su rifle de confianza. 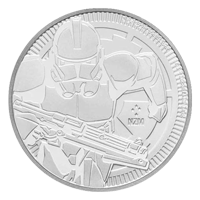 Stars Wars | Moneda de plata Clone Trooper 2019 de 1 oz Buy your 1 oz 2019 Star Wars Clone Trooper silver coin from our store today and enjoy the lowest price online. This silver coin celebrates the phenomenally popular Star Wars film series and is the fourth coin from the New Zealand mint to embrace this high action, epic sci-fi theme. The reverse feature is an officially licensed depiction of a clone trooper heading into battle with rifle in hand. Also on the coin's reverse is the stamp of quality, the Lucas Films stamp and details of metal content, weight and purity. The obverse feature is none other than Elizabeth II, shown in profile, donning her splendid Fringe Tiara. This detailed effigy is joined on the obverse by the coins title, Niue, the year of issue, the unique denominational value and Elizabeth II's name. The force is strong with this simplistic but striking coin and considering the fact that Star Wars merchandising profit hit $32 Billion in 2016 alone, you can rest assured in this coin's collectible appeal. If only you knew the power of the dark side, you would be enriching your holdings with this 1 oz 2019 Star Wars Clone Trooper silver coin already!